When you picture the average cannabis user, what do you imagine? Chances are you’re not imagining a senior citizen. Due to cannabis’ reputation as a counter-culture recreational drug, many people assume the average cannabis user to be young and liberal. While this seems like a reasonable assumption, the truth is that a large portion of medicinal cannabis patients are elderly. In fact, a recent Israeli study found that “of 279 cancer patients receiving medical cannabis, 50% were aged 60 or older”! In other words, perhaps the largest group of medicinal cannabis users is the senior citizen population. Why? Surely this percentage reflects the basic fact that older individuals are more likely to develop cancer and other diseases that may be treated by cannabinoids. Additionally, elderly populations are more likely to seek cannabis legally, while younger medical cannabis users are more likely to have other avenues of procurement. Moreover, perhaps the specific suite of ailments faced by the elderly fits the target profile of cannabis treatment. Regardless of the reason, however, the population of elderly medicinal users is far from negligible; at Cornerstone it makes up one of our major patient groups! 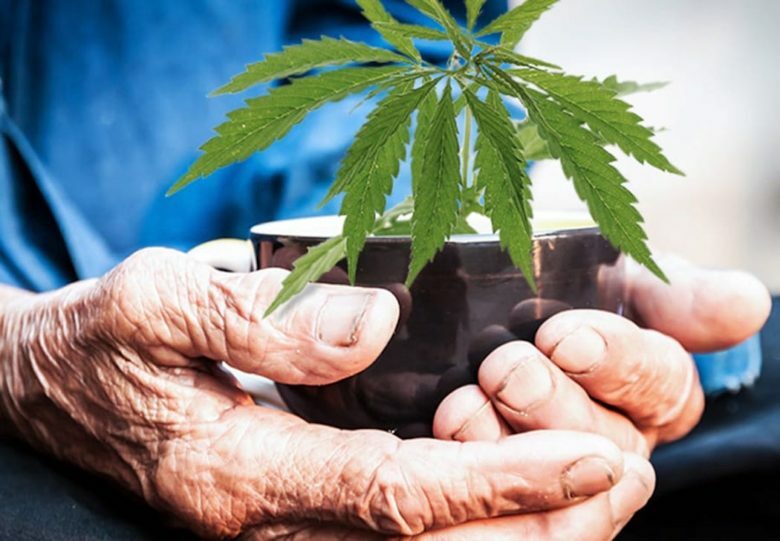 In response to this high concentration of elderly medicinal cannabis use, one research group, led by Itay Katz from the Sheba Medical Center in Israel, has conducted a review of cannabis research relating to elderly populations. This review, published February 2017 in the Israel Medical Association Journal, highlights several common areas of use, as well as Western medicine’s current beliefs surrounding the efficacy of that use. Readers will not be surprised by several topics of discussion. For instance, we’ve written previously about using cannabinoids to treat Parkinson’s Disease. Parkinson’s Disease is a neurodegenerative disorder that can yield tremor, gait abnormality, and movement dysfunction. Readers may be familiar with Michael J. Fox’s struggle to continue acting while experiencing effects of this disease. These effects seem to occur as a result of dopaminergic neuron disorder. Cannabinoids, of course, do not directly affect the dopaminergic system. However, cannabinoids have been shown to modulate “dopaminergic transmission in the basal ganglia,” meaning that they may affect the system as a whole, indirectly. This idea is supported moderately in research. In one study of 22 patients with Parkinson’s Disease, the patients exhibited a “significant improvement” of the clinical score used to diagnose the extent of the disease. Other studies confirm similar improvements, while yet others deny any connection, positive or negative. This may mean that the type of cannabinoid and method of administration plays a large role in the effectiveness of treating Parkinson’s. Dementia, another tragic disease mainly affecting older populations, is “characterized by a progressive pathological impairment of memory, language, orientation, judgment, comprehension, and overall cognition.” Dementia can be debilitating entirely and has no current treatment. At the time being, however, data suggests that cannabinoid use may be therapeutic to individuals suffering from this disease. In a placebo-controlled study, researchers confirmed that cannabinoids reduced the occurrence of dementia-induced life disruption, meaning they might help restore patient’s overall ability to function. Furthermore, preclinical lab data (data from animals or other studies not directly involving humans) suggests the role of cannabinoids in reducing disease progression. Previous Cornerstone blog research suggests that this is a result of cannabinoids reducing the inflammation that triggers self-destructive behavior in brain cell networks. However, readers should bear in mind that researchers have not established whether cannabis alone can prevent the development of Dementia, and we may not have such data for years. Beyond neurological disease, cannabis and cannabinoids may also help regulate sleep. As part of the aging process, sleep patterns morph and quality of sleep tends to drop. This difficulty in sleeping can increase the risk of cardiovascular disease and cognitive decline, as patients’ bodies are unable to fully restore each night. In general, sleep problems for the elderly are treated similarly to sleep problems for youth; doctors prescribe over-the-counter sedatives and sleeping medication such as benzodiazepines (Benadryl). Unfortunately, in some cases, physiological changes brought on by these medicines are dangerous and doctors must weigh the need for sleep with risks involved. Fortunately, cannabis has shown promise in assisting sleep. While cannabis in general reduces slow-wave sleep (which is generally seen as a bad thing), it also effectively reduces sleep disturbances. In cases where individuals are frequently disturbed from sleep, slow-wave sleep is not occurring anyway, which makes prescribing cannabis a no-brainer. Additionally, cannabis and cannabinoids are very safe and have low interactivity with other common pharmaceuticals taken by elderly, meaning they represent a viable option for sleep disorder. Finally, as readers know, “malnutrition and weight loss impose a great risk on the elderly’s health.” Elderly individuals generally experience loss of appetite, which discourages healthy eating and food preparation. Additionally, elderly digestive systems are less capable of extracting nutrients from food consumed. While studies confirming the use of cannabis for appetite stimulation in the elderly are uncommon, plenty of studies exist confirming the use of cannabis as an appetite-stimulant in cancer patients as well as the population at large. This effect may be one of the most-known side-effects of cannabis and cannabinoid consumption (think of Shaggy from Scooby Doo preparing a giant sandwich…). In the absence of further research, common sense would suggest that these effects hold in the elderly population, although whether that appetite increase translates to improved nutrition or less weight loss also remains to be seen. As cannabis continues to rebrand from recreational drug to medicinal aid, Americans living in medicinal states should feel very comfortable recommending their senior parents, friends, and patients to inquire about medicinal cannabis. As seen above, in many cases, cannabis seems to ameliorate or improve conditions without significant risk, while decreasing the need for more dangerous pharmaceuticals. Additionally, non-psychedelic preparations, such as CBD, represent an avenue for elderly patients to experience the medicinal effects of cannabinoids without psychological effect. “Clinical Evidence for Utilizing Cannabinoids in the Elderly”. Itay Katz, Daphna Katz, et al. Israeli Medical Association Journal (2017) 19:71-75.